You're Bad, So I Can Do What I Want! In the beginning was blamestorming. After eating the forbidden fruit, Eve some to Adam, and he blamed both Eve and God for his choice (Gen. 1:12). When confronted, Eve blamed Satan for her choice, and made the excuse that she was deceived (Gen. 3:13). Seems to be human nature to blame others for our own bad decisions, and to seek other ways of justifying our actions. This can be seen throughout history through today. "Unpopular Opinion Puffin" has an unpopular opinion. Atheists will use an argument from outrage, including cherry-picking things in the Bible that they don't like to justify denying God's existence and authority. Likewise, they will use Bible texts that they don't understand to make excuses for rebelling against God, such as "How can a loving God..." Well, how can an honest person not bother to do some homework on the questions? One way I've seen the "logic" of unbelievers seems to work this way: "You're not a good enough Christian to meet my arbitrary standards, therefore, the Bible is not true, there is no God, I can do what I want". Not hardly! 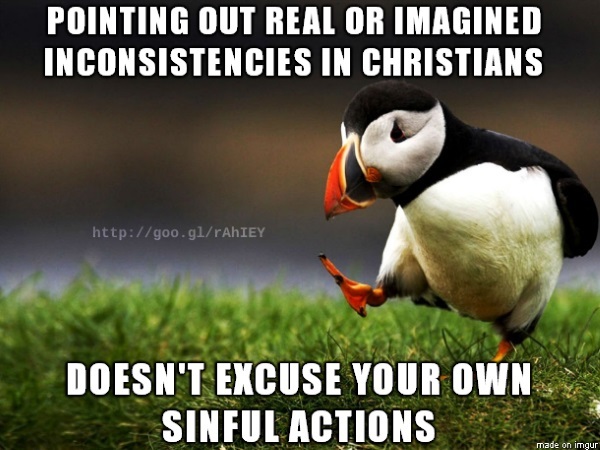 For that matter, there are Christians who will find excuses reject biblical truths that they don't cotton to. Sure, there are honest disagreements on nonessentials, but when it comes to clinging to pet doctrines and beliefs, some Christians will act just like atheists. When shown from Scripture that they may not be exactly right, people can get meaner than a burlap sack full of sidewinders. Blaming God (Job 40:8) can be seen in both believers and unbelievers. Let's back up a mite. As we know, people will pass blame and make excuses for their own behaviors. This is seen in the pro-homosexual lobby. "You Fundies can't tell us about our sins, because you have adulterers and allow other kinds of sins!" That shallow, emotionally-laden tu quoque argument is easily dismantled. For one thing, Christians who oppose homosexuality are not justifying their own sins and making them a means of identity. "Hi, I'm Bob, I'm an adulterous heterosexual white male, and I want acceptance, reinterpretation of the Bible, and special legislation to suit my lifestyle." Also, the "you do it too" reaction, whether accurate or not, is a way to distract from the main point that homosexuality is a sin according to the Bible. The same kinds of poor reasoning are used by abortionists, atheists, liberal religious people, cultists, and more. Blaming, self-justification by pointing out flaws in others, various excuses — they are excuses to cling to our sins and bad thinking. You want to call me a bad Christian? Go ahead, I admit that I've sinned and have inconsistencies. Flaws in other people? You betcha! You'll find a passel of them in professing Christians, even in our spiritual leaders. 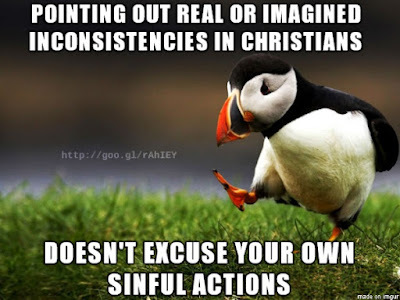 Cherry-picking verses out of the Bible so you can pretend it's untrue? It's been tried before, and keeps on failing, do your homework and see. All of those are distractions to avoid the main point that God is the Creator, he makes the rules, and we are responsible for our actions. No excuses will work. Just ask Adam and Eve. We need to humble ourselves before almighty God (James 4:6, Matt. 18:4, Psalm 51:17), repent (Acts 17:30-31, Matt. 4:17, Luke 24:46-47, Rom. 2:4), and believe for salvation (John 3:16-17, Acts 10:4, Rom. 1:16). Those who believe are assured of salvation (Eph. 2:5-7, John 1:12-13) through the faith (Eph. 2:8-9). No excuses. A group of scientists got together and decided that man had come a long way and no longer needed God. They elected one scientist to go and tell God that he was now irrelevant. 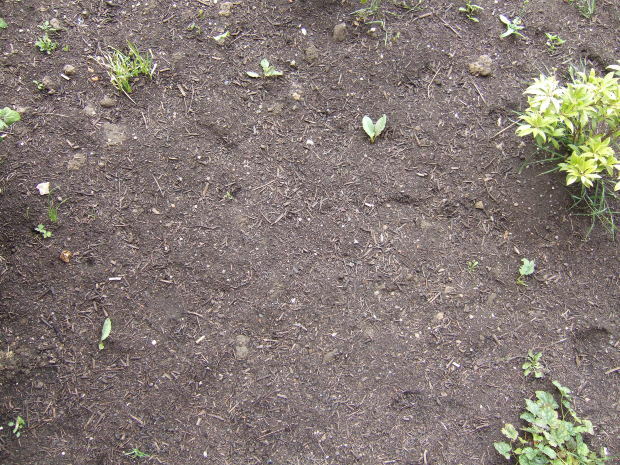 The scientist said, “You got it”, and bent down and grabbed a handful of dirt. Aside from the arrogance of man thinking that God is not needed because we've evolved beyond the need for him (or that he does not exist at all, Rom. 1:18-19), some people insist on believing in evolution and then slapping God's name on it to justify their belief in rebellious pseudoscience. Although many theistic evolutionists claim to believe the Bible, they elevate man-made science philosophies to the magisterial level for their authority; those owlhoots dare to tell God what he said and means. Maybe they believe the Bible is a text that God preserved, but do they believe what it says? The rest of us will continue reading the Bible with historical-grammatical exegesis. Although belief in special creation is not essential to salvation, Genesis is foundational to the gospel message. Theistic evolution is easily refuted in the minds and spirits of those who actually believe the Word of God. In some sermons on Genesis, Dr. John MacArthur pointed a few things and sparked some ideas that I'm going to present to you. Evolution means not only that God is not in authority over creation, but that God's Word is false. God made man out of the dust of the Earth, וַיִּיצֶר יְהוָה אֱלֹהִים אֶת־הָֽאָדָם עָפָר מִן־הָאֲדָמָה וַיִּפַּח בְּאַפָּיו נִשְׁמַת חַיִּים וַֽיְהִי הָֽאָדָם לְנֶפֶשׁ חַיָּֽה׃ , Gen. 2:7. Adam was made separately from the animals, and had the personal touch of God breathing into him the breath of life. This was not just physical life, but also spiritual life. Man was a separate, distinct creation, and you cannot get anything resembling evolution or long ages from the text. Animals were also formed from the ground (Gen. 2:19) and then brought to Adam to give them names, but there was no suitable helper for him. The critters were different, lacking the abilities to reason and have meaningful interaction with him; a cowboy may talk to his horse while riding herd, but that's not exactly fulfilling for him. So God did something different for his special creation, and made woman from his side (Gen. 2:21). Adam did not have to wait for his wife to finish evolving, nor was she a separate species. She came from his side to stand with him, not as an inferior creation. Edit: Adam called her Eve (Gen. 3:20), another indication that she was unique and not just one of many co-evolving humanoids. The Bible clearly refutes evolution for the Christian. In Genesis 2:8-14, we are given details about they layout of Eden. It wasn't just a tiny plot of land, but rather a big place. Such details are not the stuff of mythology, legend, poetry, or allegory. Genesis sets forth the foundation that God's plan for marriage is one man and one woman (Mark 10:6-9). Jesus (Mark 10:6), Paul (1 Tim. 2:13, 1 Cor. 15:45), Jude (1:14), and others in the Bible treat Adam as an actual historical person and creation as a real event, not an allegory or poetry. To say that it is nothing less than actual history is to call Jesus and others either liars or stupid. Like atheists and cultists, theistic evolutionists and other compromisers try to put Bible-believing Christians on the defensive — especially biblical creationists. (Interesting that theistic evolutionists cozy up to atheists and join forces to ridicule us, isn't it? So much for John 13:35, 2 Cor. 6:14-15, Gal. 6:10, and other verses.) Some will claim superior knowledge of Scripture and require that we answer certain questions they think we cannot answer (Steve Risner and Tony Breeden each wrote a series that shredded one compromiser's rant, and Charlie Wolcott addressed old Earth creation and theistic evolution). I reckon we should turn things around and find out if they claim to believe the Bible, do they believe what it says? Some TEs claim to believe the Bible, but from their conduct, they don't appear to do so. Not only do some of them treat many Christians like garbage, but to get millions of years and evolution out of the Bible, eisegesis is necessary. God takes a dim view when people add to his words, see Prov. 30:16 and Rev. 22:18-19, and also note that in 1 Cor. 4:6, Paul cautioned believers not to go beyond what is written. Although Peter heard the voice of God during the transfiguration of Jesus, he said in 2 Peter 1:19-21 that the Word of God is more certain! Having a dim view of God's Word, adding to it, not following the teachings, causing divisions (Jude 1:17-19, Rom. 16:17), compromising with unbelievers and their philosophies — apostates and false teachers are heading for serious trouble (Jude 1:4). We were warned not only about false teachers, but that scoffers would try to denigrate the Word of God (2 Peter 3:3-4). The rest of us are to continue in the Word, which is sufficient to equip us for godly living (2 Tim. 3:16-17). Philosophies will come and go, but God's Word stands forever (Isaiah 40:8). A follow-up to this article is here.